Adam Brimmer catches up with MPO chairman Sigmund Mifsud ahead of the kick-off to the orchestra’s US and Russian tour. How was the idea for this tour born? The Malta Philharmonic Orchestra (MPO) management has always insisted on the importance of having international tours for the orchestra. After we had sorted the MPO European tour with the European Foundation for the Support of Culture (EFSC) last year, we started to discuss with EFSC presi­dent Konstantin Ishkhanov about where we could go to next. It was then that we started to dream of going to New York to perform in Carnegie Hall. We were lucky that the date that was given to us was during the period when Malta is still hosting the European Capital of Culture, and therefore everything started to line up towards creating a really challenging, but memorable, tour. What is the aim behind the upcoming tours? Like any other tour, the main aim is to export the musical identity of our country through the performances of our national orchestra. As with every tour, this will once again offer new motivation to our musicians. 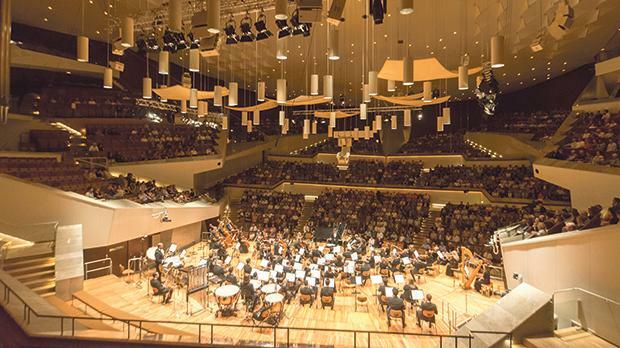 Performing in such prestigious concert halls is a very important experience for every musician. This, together with the sense of responsibility of performing for our country, provides them with a natural boost. Going on tour is also a natural team-building exercise for any orchestra; it sets everything in a new dimension and this feeling is very tangible. What was the role of the European Foundation for the Support of Culture in this? The EFSC is one of the MPO’s main partners. We have been collaborating together in different pro­jects for the past three years and we have a very good working relationship. They are the main tour producers and organisers. At which venues will you be playing and why did you choose them? As explained, Carnegie Hall was our first choice, and we built the whole tour around it. After we managed to confirm a date at this prestigious theatre, we discussed the idea of touring the US in another two concert halls, specifically Kimmel Centre for the Performing Arts in Philadelphia and The Music Centre at Strathmore in Maryland. It was Konstantin’s idea to amalgamate Russia in this tour, and the choice of Russian venues was finalised by him, since he is very knowledgeable about the cultural scene in the country. In fact, we will be performing in two of the most prestigious venues in Russia, which are the Grand Hall of the Moscow State Tchaikovsky Conservatory in Moscow as well as Miriinsky Theatre in Saint Petersburg. Pulling off Carnegie Hall in New York is no mean feat. What contributed to your request being accepted? We are elated. It wasn’t an easy task, but I am sure that we were able to secure this legendary venue thanks to the growing international profile that our orchestra has been making in the past few years. Still, we are honestly grateful and humbled that this dream is coming true. Will the whole orchestra be going up for this tour? Yes, and then some. We will be 70 musicians in total, which is 10 more musicians than the full complement of our orchestra. On such occasions it becomes more apparent that we do not have a large enough nucleus of musicians to present great works on such important platforms, and therefore we needed to bring the extra musicians on board. What are the challenges of organising this kind of large-scale tour with an orchestra? The challenges are truly never-ending. Starting from the fact that one has to logistically organise the itinerary of flights, transport and accommodation. And we will also be trying to have at least one of our concerts re­corded through an important music television station, as we had done with Mezzo and Medici TVs for the European tour. What works will you be performing? We always include a piece by a Maltese composer when we perform abroad. This year, the choice of Joseph Vella was a natural one since he passed away in February 2018. For many years, Vella was also the composer-in-residence of the Malta Philharmonic Orchestra and for this tour we chose his most popular piece Rebbieħa, Op.45. Rebbieħa is a symphonic poem, first performed by the national orchestra in 1986. The title – Victorious – refers to Malta’s chequered history, and the country’s ability to overcome the challenges it has faced over the centuries, not least the Great Siege of 1565 and the bombings and deprivations of World War II. For the second piece, we will be joined by pianist Ingolf Wunder who will be the soloist in Alexey Shor’s Travel Notebook, which was premiered by the MPO last year and has already been taken on the orchestra’s European tour. Travel Notebook is a suite of seven short virtuosic pieces for piano and orchestra, which are inspired by the composer’s visits to particular locations. The main work in this programme, which will be conducted by Armenian conductor Sergey Smbatyan, is Symphony No. 5 by Dmitri Shostakovich. This symphony, largely regarded as a staple in orchestral repertoire, was composed months after the composer’s official denunciation, at the height of the Soviet Union’s Great Purge, and its famous last movement, written in a cheerful tone starkly contrasting the rest of the work, is widely believed to have been a mocking satire of the regime. What benefits do you feel that this tour will have for Malta’s national orchestra? Touring is what keeps an orchestra alive. It provides motivation and a feel good factor. It is a momentous and prestigious event, for each individual musician, the orchestra and the country in general. When will the tour kick off and how long is it? The tour will kick off with a concert in Malta on November 24 at the Mediterranean Conference Centre. We are inviting the Maltese public to come share this experience with us on Saturday at 11am, before the musicians head off for the first leg of their epic tour to the US and Russia.